SINN Féin’s Member of the European Parliament for the north Martina Anderson says it is “imperative” that people here are made aware of the “disastrous implications” a Brexit – Britain leaving the European Union (EU) – would have for Ireland. With a referendum expected to take place as early as July on Britain leaving the EU, and with Secretary of State Theresa Villiers campaigning to leave, Sinn Féin are warning local voters here of the consequences of such an outcome. 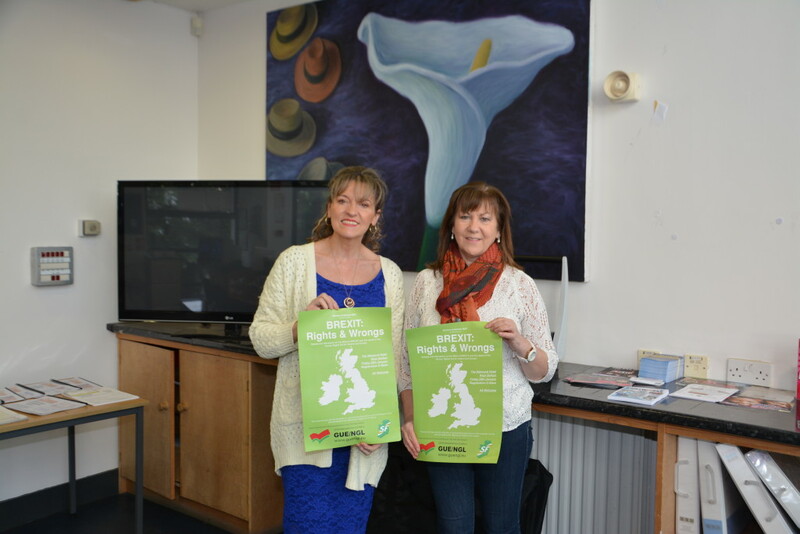 A conference, debate and discussion entitled ‘Brexit: Rights and Wrongs’ will take place on Friday January 29 at the Balmoral Hotel in Belfast chaired by Martina and party colleague, West Belfast MLA Rosie McCorley. Guest speakers on the day will include Labour MEP Claude Moraes, solicitor Kevin Winters and trade union representatives. Speaking to the Daily Belfast ahead of the conference Martina stressed that she would encourage “as many people as possible, from all sections of the community, to attend this important event”. “The conference is going to have two strands, the first is going to be dealing with the British government’s repeal of the Human Rights Act for Ireland. I’ve been working very closely with my colleague Rosie McCorley on this and the implications for the north. “If the Act was to be repealed we would need to look at how that would affect the families in Belfast, who have the right to challenge the British government through the 1998 Human Rights Act. “We all know the British government’s involvement in collusion, from Bloody Sunday, the Ballymurphy Massacre through to Pat Finucane and rightly you have families challenging the British government with the Human Rights Act, where you have the right to a proper investigation and we know that hasn’t happened in a number of cases. “You only have to throw a stone in West Belfast and touch somebody who has been affected by that. If the British government repeal it it would make it harder for families to take a legal stance, a legal challenge as many have done. “There is not doubt that a Brexit would have adverse implications for our peace process,” she said. Agriculture Minister Michelle O’Neill will also be in attendance at the Balmoral Hotel next week, as Martina explained that there are also big concerns for CAP (Common Agricultural Policy). “If it wasn’t for Europe there would be no single farm payments, no rural development fund, no funding streams,” she said. “We wouldn’t have a farming industry in the north if it wasn’t for CAP. Martina added: “British Secretary of State Theresa Villiers wants a Brexit – that is no surprise to us Irish republicans. The British government is not representing the interest of us here in Ireland, they’ve never done so and never will as far as I’m concerned. “We are not even on the consideration list of what happens if Brexit goes ahead. “Theresa Villiers would not be interested in the sterling work that goes on with groups and organisations across West and North Belfast, that do their work on very small pots of money. Martina said that there had already been a lot of interest sparked ahead of the conference date. “We want people involved in this conference. People need to know what this is going to mean to the victims of families, we need people to know Brexit and its implications. “We believe there should be a separate vote here in the north. We do believe our place is in Europe. Brexit: Rights and Wrongs Conference will take place on Friday January 29 at the Balmoral Hotel. Registration takes place from 9.30am. All are welcome.